An Image OCR script is used to convert an image into plain text. This is often used when a website uses a CAPTCHA page to block automated access to the website. A CAPTCHA page contains an image with numbers and characters that a user must recognize and enter in plain text. Some websites also display emails and phone numbers as images, and an Image OCR script can be used to convert those images into plain text, making the data more useful. Content Grabber does not include any OCR functionality, so you must use a 3rd party OCR service. The Image OCR script is used to integrate with a 3rd party service. 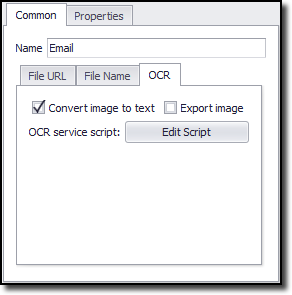 An Image OCR script can be added to a Download Image command by selecting the OCR configuration tab and setting the option Convert image to text. The function must return the converted image as a string. The image that needs to be converted to text. The current agent command being executed.